This article aims to assess the role played by the rule of law in discourse by critics of the Singapore Government’s policies and in the Government’s responses to such criticisms. It argues that in the past the two narratives clashed over conceptions of the rule of law, but there is now evidence of convergence of thinking as regards the need to protect human rights, though not necessarily as to how the balance between rights and other public interests should be struck. 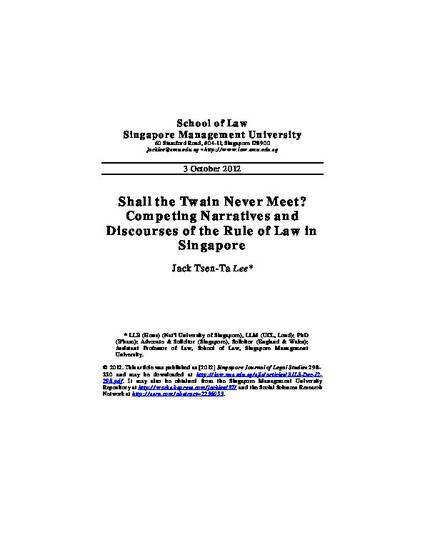 The article also examines why the rule of law must be regarded as a constitutional doctrine in Singapore, the legal implications of this fact, and how useful the doctrine is in fostering greater solicitude for human rights.